It may seem pretty straight forward, but to the angler who’s just picked up their first Spey rod, or is considering doing so, correctly rigging two-handed tackle can sometimes be a daunting affair. As guides we see a lot of "unconventional" rigging techniques make it to the water. 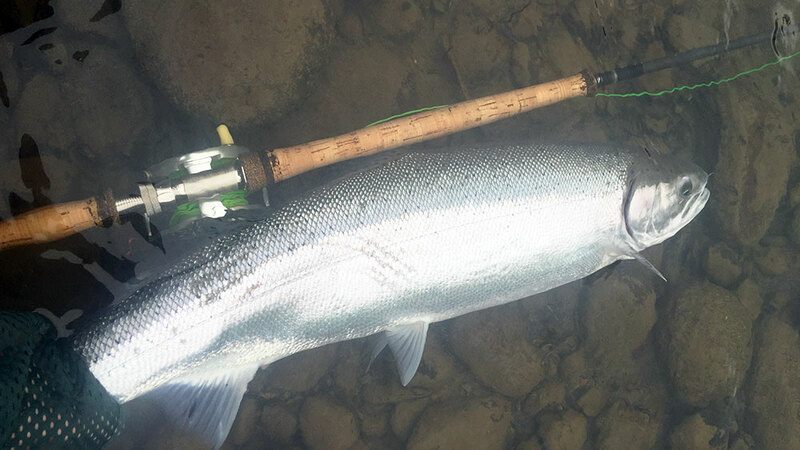 Heads that are backward, Scandis attached to Skagits, and a variety of others that just don't make your rod work as efficiently for you as it could. Let’s start with an empty reel. The first part of your line set up is your backing. The backing is attached to the spool with an arbor knot reinforced with super glue. On a standard steelhead set-up, 150 yards of 30 lb Dacron is appropriate. If you are targeting larger fish like Chinook or Atlantic salmon, 250-300 yards puts the odds more in your favor. In the end of your backing, a double surgeon’s knot will form a loop large enough to pass the next part of the equation: your spool of shooting line. Your shooting line attaches to your backing. The shooting line is the portion of your line that is pulled out by the mass of your shooting head when you cast. For a full explanation of the various shooting lines, check out A History of Shooting Lines. Loop to loop connections are widely regarded as the stronger connection. We like to use two opposing double surgeons’. If your shooting line doesn't come with a factory loop, two nail knots coated with super glue can be used to form one. This is not a necessary addition but we highly recommend it. We all use them in each of our set ups. The constant circular motions used in Spey casting put twists into your shooting line which is the chief cause of tangles while casting. A Spey swivel helps prevent this. Loop to loop it to the end of your shooting line. If you are using monofilament shooting line, you can cut one loop off the swivel and attach it directly with an improved clinch knot. The engine of the whole Spey train is the shooting head. The shooting head is the large portion of colored fly line that generates the rod load and ultimately delivers your fly. On all these heads there is a defined front end and rear end. On our two most popular brands, RIO and Airflo, the ends are colored. RIO shooting heads feature a rear loop that is hot orange. Airflo designates theirs with a black rear loop. On some heads, such as OPST commando heads, there is no marking. A tag is simply put on the rear end to identify it, a difficult task once the tag has been removed and the shooting head is in a line bag. For this reason, if there isn't a colored rear loop we will take a felt marker to ours to prevent confusion. The shooting head is also looped to either the factory loop in the end of the shooting line, or your Spey swivel. Attached to the end of the shooting head is the tip. The tip designates how deep you will fish and range from floating to heavy sinking. There are two commonly used tips out there: "T" tips or tungsten sink tips such as Airflo FloTips, or RIO’s MOW tips. RIO’s MOW tips come in everything from floating to full 12.5' sinking tips. These tips are designed to be used with Skagit line systems. For the difference in Skagit and Scandi refer to Mark’s article, Comparison of Skagit and Scandinavian Shooting Head Line Design. There are also tapered leaders with a sinking coating around them such as RIO VersiLeaders and Airflo PolyLeaders. These come in a variety of sink rates ranging from full floating to 6-7ips. They are specifically designed for use on Scandi shooting heads. They do not have a loop in the end as leader is designed to be blood knotted to it, but putting a double surgeon’s knot in the end to loop your leader to is perfectly acceptable. For leader, Maxima Ultragreen is pretty hard to beat. Tie a double surgeon’s in a 4’ section and attach it to your tip. Longer leaders aren't necessary. With short leaders, your fly follows the depth of the tip. With a longer leader, the tip is at depth and the fly is still in the upper water column. For most steelheading we prefer 12lb. 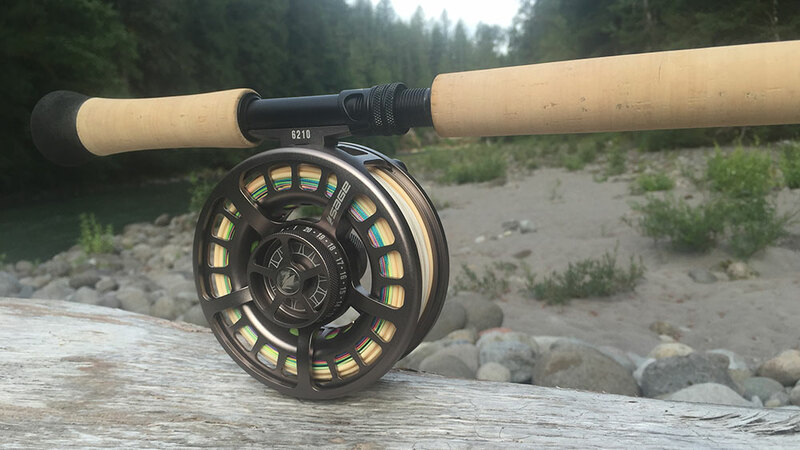 For very large steelhead such as Skeena or Dean River fish, 20lb. is the norm. 20lb. is commonly used for targeting Chinook as well. Attach your fly with a mono, non-slip loop knot and you’re rigged and ready to go.